Hydraulic Breakers for Excavators are available from RJ Hydraulic Hammers and Heavy Excavator Parts. We maintain a fully stocked warehouse with models from 200 ft lbs up to the large 12,000 ft lb model. We can supply a Hydraulic Breaker to fit any size/ any model excavator. 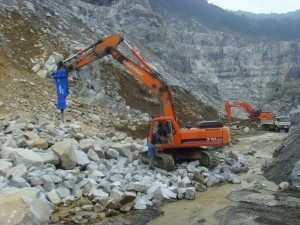 Please click on the words “Hydraulic Breakers” and you will be directed to information about each model of our world class Hydro Ram brand hammers. We are Worldwide Shipping Specialists. We can ship directly to your door or directly to your jobsite… anywhere in the world. Our customer service skills and our years of equipment experience will help to guide you through the installation and smooth operation of your new hydraulic breaker. At left is a photo of the Hydro Ram model HK220 mounted on a Caterpillar 320. Call us Toll Free 888-651-0187, Outside US 1-727-215-4924 or email us at [email protected] if you have questions. Please also visit our newly redesigned website at www.besthammers.com.